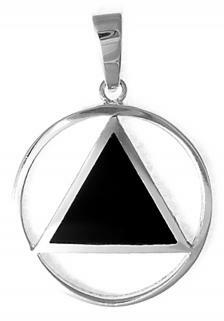 Made of Sterling Silver this beautiful tribute to the AA Circle Triangle Symbol is inlaid with Black Enamel at its center. This is a handcrafted piece so please allow up to 2 weeks for delivery. CHAIN NOT INCLUDED.